RAPAPORT... Chinese diamond companies will send large stones for polishing at a new manufacturing facility in Israel, the Middle East nation’s industry body said. 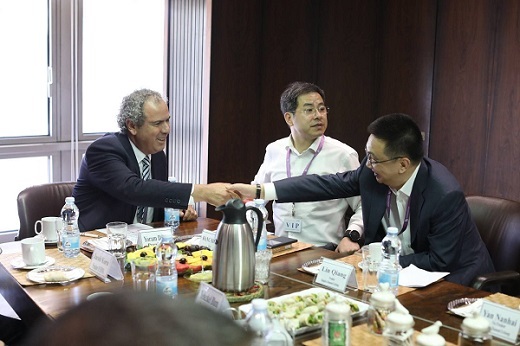 Bourses in the two countries reached the agreement this week during a visit to Israel by Lin Qiang, president of the Shanghai Diamond Exchange (SDE) (pictured, right). The new factory is due to open in January at the next International Diamond Week in Israel. The deal is part of a wider memorandum of understanding (MoU) Qiang signed with Yoram Dvash, his counterpart at the Israel Diamond Exchange (IDE) (left). Under that MoU, the two nations’ diamond industries will also make offices and other trading spaces available for each other to use, and allow joint participation in educational courses, the Israel Diamond Institute (IDI) said Wednesday. Both sides will also help each other develop their diamond industries. Israel’s polishing sector has dwindled as lower costs have helped India increase its market share. However, cutting of bigger diamonds has largely remained in Israel due to local expertise, the country’s industry leaders claim. The IDE and the IDI are investing more than $3 million in the new large-stone manufacturing plant in the Ramat Gan bourse complex in an attempt to reinvigorate its polishing trade. It will feature two cutting centers, spanning 1,100 square meters, and will employ about 150 polishers. The organizations expect the factory to yield thousands of polished stones per year from 5 carats upward.